Branwyn Jones has taught English at Michigan’s oldest community college for nearly 30 years, but it wasn’t until she and her colleagues joined MEA and negotiated their first contract that she says she earned her Ph.D.—in contract bargaining. MEA President Paula Herbart speaks with Kathy Gardner, a kindergarten teacher at Meadowbrook Elementary School in Walled Lake, during a Listening Tour stop in Commerce Township. The Northwestern Michigan College instructor attended a Traverse City Listening Tour stop with two of MEA’s new officers. Jones told President Paula Herbart the union provided invaluable expertise during 18 months of difficult talks following the faculty’s vote to join MEA in 2015. 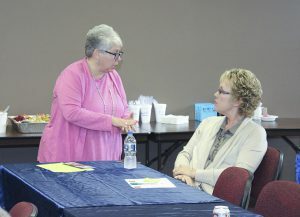 Dozens of MEA members and retirees have visited with President Paula Herbart, Vice President Chandra Madafferi, and Secretary-Treasurer Brett Smith at Listening Tour events across the state as the new leadership team seeks to chart a future course with member input. He said his local members are tapping a renewed sense of purpose as a teacher shortage has taken hold in Michigan. In recent years stagnating wages and lowered benefits, along with unwarranted criticism of educators, are driving people away from the profession. “We’re energized in terms of fighting back for our younger teachers,” he said. Being part of decision-making was the topic Glen Lake bus driver Barry Mazurek wanted to discuss in Traverse City. The president of his local transportation association said his members get frustrated when school administrators debate schedule changes without consulting drivers. Starting the school day 15 minutes earlier might not seem a big deal to some school employees, he said, but for drivers it could be the difference between roads being plowed or snow-covered in the winter. 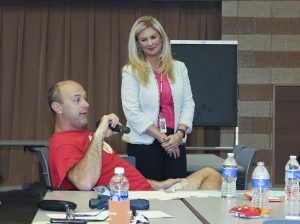 Communicating the true story of public education to parents and advocates is a vital role that MEA must play in pushing back against so-called “choice” policies that undermine traditional neighborhood schools by diverting tax dollars to for-profit businesses, according to Seth Furlow, a chemistry and biology teacher at Novi High School. Northville Education Association President Tom Silak says state funding cuts have made school administrators more worried about their districts’ external image, while educators focus on what’s best for students–a frustrating disconnect between the two. At a tour stop in Utica, the officers and members talked about what inspires them to continue doing their job despite challenges—and what educators and their union can do together to help. UEA member Lisa DiPirro shared a story about a parent who wrote a letter 20 years ago praising DiPirro’s work improving her child’s reading skills. Recently, that student—now grown with a child of her own—caught up with her on Facebook. The group also discussed frustrations with attacks on the teaching profession and the lack of respect for educators—including ways to push back when skeptics question why educators need to be compensated as professionals. They also decried the “Hunger Games” mentality bred by new evaluation systems, while recognizing that the changes MEA helped advocate for recently in state law around evaluations helped significantly. Herbart said she’s proud to hear from members thankful for all MEA does to advocate for public education, but the new officers want to do more. “We want to do more that really stretches what you think MEA can do—and stretches even what we think we can do,” she said. The officers are hearing the frustrations of educators asked to do more with less—coping with large class sizes while supplying their own resources and providing their own professional development. Meanwhile, pay and benefits have slid downward in the past several years. “We need to honor the sacred commitment that educators have kept to their students, their districts, their state and country,” Herbart said. In addition to conducting the Listening Tour, MEA’s new officers have been criss-crossing the state attending local union meetings and school events wherever they can—logging hundreds of miles, starting even before their new jobs officially began on Sept. 1.